After suffering severe burns, this cat is being treated at the BluePearl Veterinary Partners hospital in Midtown Manhattan. 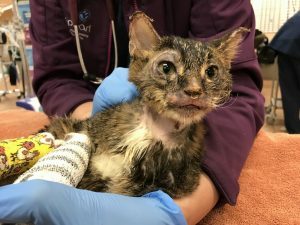 This poor kitten suffered burns on 40 percent of his body, but has been getting great medical care at BluePearl’s Midtown Manhattan hospital, plus incredible support from the Animal Care Centers of NYC. The kitten’s story was carried by people.com and the New York Daily News. A rescuer found the kitten, and no one knows exactly what caused the burns. He is such a fighter that he was given the name Hugh Jackman, after the actor who often plays the role of a superhero.